The latest numbers from market research firm IDC reveal that Mac sales experienced a slight year-over-year decline in the second quarter, dropping to 4.4 million from 4.8 million during the year-ago period. Apple fell behind ASUS to finish as the fifth-largest PC vendor by shipments worldwide, with 7.1 percent market share through late June. Apple had 7.4 percent share in the second quarter of 2015 comparatively, according to IDC's data. 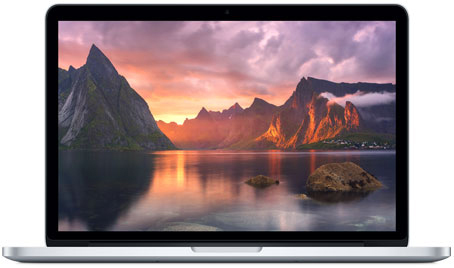 The decline can as typical be attributed partially to seasonal fluctuations and increased competition, but many prospective buyers are patiently impatiently waiting for Apple to release its next-generation MacBook Pro and other refreshed Macs. Apple has not updated the MacBook Pro in over 400 days. The hope, supported by multiple rumors, is that it will release a redesigned MacBook Pro with faster Skylake processors and Thunderbolt 3 with USB-C in the second half of 2016. The top-of-the-line model could sport AMD's new 400-series Polaris graphics chip. KGI Securities analyst Ming-Chi Kuo said Apple will launch two thinner and lighter 13-inch and 15-inch MacBook Pro models in the September-December quarter. The notebooks are expected to feature a new OLED touch bar positioned above the keyboard, Touch ID, and hinges made from metal injection molding. Overall PC sales totaled an estimated 62.4 million worldwide in the second quarter, a year-over-year decline of 4.5 percent, as the PC market continues to decline. Nevertheless, North American PC shipments increased for the first time in five quarters, reflecting the strength of the U.S. dollar and "relative market stability." 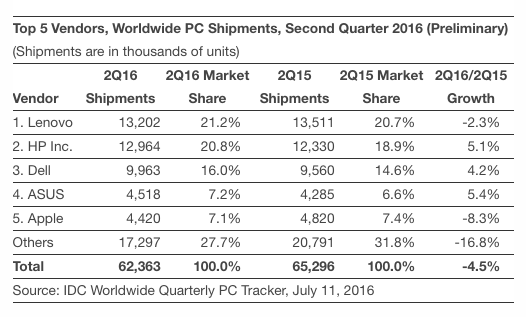 Gartner has also released similar worldwide PC shipment data for the second quarter. Releasing computers would probably boost their computer sales. Yep, no wonder. Apple hasn't paid much attention to the Mac. Just look at the Buyer's Guide on MR and it's pretty depressing how outdated across the board all Macs are. Pretty embarrassing IMO. Oh come on guys, they've been busy with making new watch bands. How can a company be good at everything, huh? release a new mac pro and I will buy it today. So surprising that selling pathetic outdated tech AND at insultingly overpriced prices leads to this. "many prospective buyers are patiently waiting ('https://www.macrumors.com/2016/06/16/hardware-free-wwdc-second-half-2016/') for Apple to release its next-generation MacBook Pro"
Lol Macrumors, patiently waiting? The forums are going nuts at every opportunity about the lack of a new MacBook Pro, nobody is being patient.